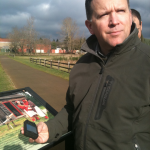 The Fort Vancouver National Historic Site wants to lead the National Park Service into the 21st century by incorporating cutting-edge technology, seeking out a younger demographic, and pioneering new approaches to historical interpretation. The Fort Vancouver Mobile project team has been assembled in response to this call, bringing together 18 technical experts and scholars from throughout the digital humanities field — including historians, archaeologists and academics specializing in digital media production as well as literature, rhetoric and writing. Together, with the help of dozens of volunteers from throughout the community, this team has created an innovative mobile app and narrative content for the historic site, an urban attraction, on the banks of the Columbia River, which draws more than 1 million visitors per year. This app — or application, essentially a piece of software that runs on a mobile device, such as the iPhone — takes advantage of the emerging capabilities of mobile devices as storytelling tools. These dynamic and interactive instruments can deliver and receive digital media — text, audio, video, photographs, animation — in ways that illuminate history while also empowering and connecting diverse communities. The Phase 1 (the proof-of-concept phase) is complete, and this Phase 2 Start-Up Grant will propel the project into a deeper realm of development and discovery, focusing on women and domestic life at the site during the mid-1800s, while also funding the creation of unique mobile storytelling prototypes to serve as models for the field. 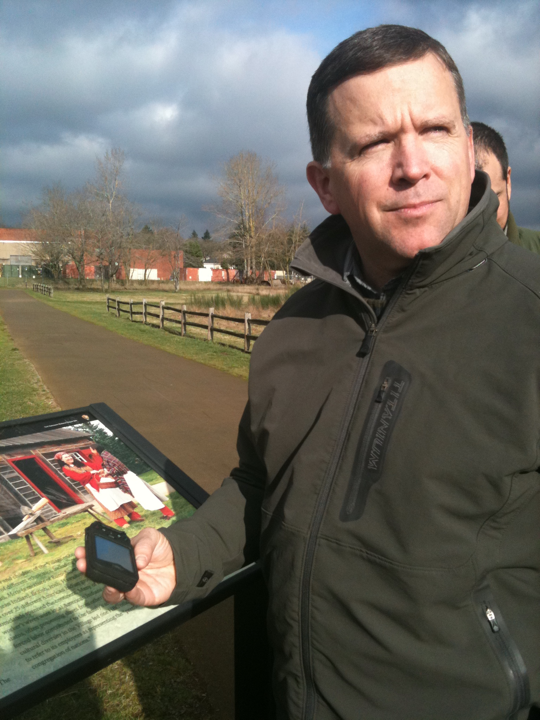 Unlike expositional predecessors, such as museum audio tours and podcasts, the Fort Vancouver Mobile project creates interactive modules to be used on mobile phones that allow user feedback and spark invention as part of the continual development of the content. This ground-breaking approach integrates documented history at the fort site with immersive narrative techniques designed to engage users in substantial open-ended plots, through location-specific multimedia content. The proof-of-concept phase, completed in October 2010, was built through collaboration among the digital technology scholars, with broad technical expertise, bolstered by the mobile app specialists at Montana Banana Design and Development, a Seattle-based firm. The digital media has been coded in XML format to allow easy transition across platforms, as the technology evolves, while the initial modules for the app were written in the two most popular mobile formats in the United States right now: Objective-C (Apple, for the iPhone and iPad) and for Android (Google) devices, firmware 1.5 and higher. Content captured and generated by users via their mobile phones is being archived and will be shared at the Phase 2 project website, produced in XHTML, CSS, and PHPand built by the highly experienced web designers already on the team. The Fort Vancouver National Historic Site is the most popular historical attraction in the Portland-Vancouver metropolitan area and a major archaeological resource, with more than 2 million artifacts in its collection. Most of those pieces, gathered from more than 50 years of excavations, are kept in warehouses, along with the boxes of documents, drawings and other assorted historical records in storage that, because of severely limited access, obscures the fascinating and multicultural history of the place, once dubbed the “New York of the Pacific.” The fort served as the early end of the Oregon Trail, the regional headquarters of the British Hudson’s Bay Company’s massive fur empire and the first U.S. Army post in the Northwest. National Park Service staff members have begun to explore technological enhancements to their traditional interpretation efforts, such as on-demand podcasts. Scholars at nearby Washington State University Vancouver have been investigating for some time the promise of digital storytelling, particularly techniques using mobile communication devices. The Fort Vancouver Mobile project brings those interests together and has gathered other institutional support, from Texas Tech University, Portland State University, and the Center for Columbia River History. It also has attracted several regional experts in new media production. The proof-of-concept phase of the project was funded by a Clark County Commissioners’ Historical Promotion Grant, a Washington State University Vancouver Research Mini-Grant, and a private grant. In turn, the bulk of the resources for the Phase 2 project also is being provided by the universities and participants, including virtually all of the equipment and lab space. The majority of the grant funds labor to research, produce and distribute more of this content, then to disseminate information about it as an open model to inspire further innovation. These trailblazing efforts not only will resurrect fascinating nonfiction tales about the convergence of European and Native American cultures in the mid-19th century at what now is called the Fort Vancouver National Historic Site. This project also is intended to give new paradigms to important ideas and societal issues that transcend time and technology. The physical site – on the north bank of the Columbia River – was the hub of a 700,000-square-mile fur trading dynasty, called the “Columbia Department,” and later it became home to such notable military leaders as Ulysses S. Grant, George C. Marshall and Oliver O. Howard. Creating a deeper sense of the context of this place is one of the most intriguing abilities of modern mobile technologies, allowing exploration in four dimensions. Through this approach, visitors can go beyond the basic linear tourism models into the wild frontier of abstract (re: “multi-linear”) and immersive experiences that inspire individual interpretation and interaction among participants. Once settled there, another major goal of this project is to share the findings openly and welcome others to follow along. That altruistic mission has attracted a diverse team of scholars, storytellers and technicians. These collaborators are experts in the fields of new media, history,archeology, cultural tourism and mobile content production, and the proof-of-concept has been well received. More resources, though, are needed for the project to take the next step and to establish more modules on an increasingly robust prototype, while launching a long-term foundational framework to sustain the momentum. Fort Vancouver Mobile Phase 2 charts this fertile, yet mostly unexplored, territory of women and domestic life at the Village. Because of who wrote the histories, the stories of men tend to dominate the documentation ofthe period, but the roles of the women who lived and worked around the site during that era are equally as compelling. As lead PI of this part of the project, I will focus on this critical period of development of Northwest culture and how women affected it. My story development team includes key fort staff (curator Tessa Langford, archaeologists Dr. Doug Wilson and Dr. Robert Cromwell and Chief Ranger Greg Shine) as well as digital storytelling specialists from WSU Vancouver (Dr. John Barber, Brett Oppegaard and Will Luers) and Texas Tech University (Dr. Brian Still). Media production assistance also comes from prominent regional media consultants specializing in videography (Tom Turner, Forrest Burger and Mark Dodd), new media (Jon Nelson) and still imagery (Troy Wayrynen). An advisory board formed to consult on major issues relating to historical authenticity and technological implementation includes Tracy Fortmann, Superintendent of the Fort Vancouver National Historic Site; Dr. Steven Fountain, WSU Vancouver history professor who specializes in the fur trade era; Dr. Fred Kemp, Texas Tech professor of new media; and Donna Sinclair, a Center for Columbia River History historian. Besides responding to informal queries, the advisory board will be formally consulted during critical development stages. In addition to the original content and app, this team also will deliver extensive Web documentation of the project and attempt to disseminate those results widely through academic journals and scholarly conferences but also in the mass media. Local news media already has been covering the progress of the project, and two preliminary sites have been established to share such information: www.mobilestorytelling.net, which provides an extensive resource list for mobile story developers, and www.fortvancouvermobile.net, a behind-the-scenes blog on this specific Fort Vancouver Mobile project.